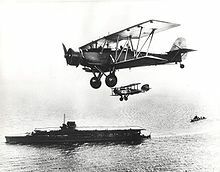 The Blackburn Shark was a British carrier-borne torpedo bomber built by the Blackburn Aircraft company in England. 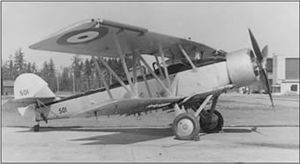 It first flew on 24 August 1933 and went into service with the Fleet Air Arm, Royal Canadian Air Force, Portuguese Navy, and the British Air Observers' School, but was already obsolescent in 1937 and in the following year, replacement by the Fairey Swordfish began. The Blackburn Shark was designed and built, initially as a private venture, to Air Ministry Specification S.15/33 for a torpedo-spotter-reconnaissance aircraft to be operated by the Fleet Air Arm. It had a crew of three, with observer/wireless operator and gunner sharing the second cockpit (open on Mks I and II, enclosed on Mk III). Armament cosisted of one fixed, forward-firing .303 in (7.7 mm) Vickers machine gun, plus a .303 in (7.7 mm) Vickers K machine gun or Lewis Gun mounted on a Scarff ring in the rear cockpit, with provision for a 1,500 lb (680 kg) torpedo or equivalent bombload carried externally. The Blackburn "B-6" prototype with a 700 hp (520 kW) Armstrong Siddeley Tiger IV was flown at Brough on 24 August 1933. The aircraft subsequently began Naval aviation tests at the Aeroplane and Armament Experimental Establishment (A&AEE), RAF Martlesham Heath on 26 November 1933. The following year, deck landing trials on the HMS Courageous proved successful with Blackburn winning an order from the Fleet Air Arm in August 1934, to contract No 334315/34 and the new Specification 13/35. I, and further contract No 510994/35 to Specification 19/36 issued in January 1937. The prototype was subsequently fitted with twin floats and was test flown at Brough in April 1935 with successful sea trials taking place at the Marine Aircraft Experimental Establishment Felixstowe. More contracts followed, and during the three years of production, 238 Sharks were delivered to the Fleet Air Arm, comprising 16 Mk I (Tiger IV), 126 Mk II (760 hp/567 kW Tiger VI) and 95 Mk III (760 hp/570 kW Tiger VI). Picture - Fleet Air Arm Blackburn Shark in company with a Westland Wapiti, seen flying over HMS Courageous. The Shark entered service with 820 Naval Air Squadron in May 1935, replacing Fairey Seals, equipping a further two squadrons (810 and 821) in 1936. Front line service was short lived, the type being replaced by the Fairey Swordfish in 1937. At least 22 Mk IIs and IIIs (all brought up to Mk III standard) were converted 1937/38 as target tugs and operated in this role and for training and communications until 1942. Sharks based in RAF Seletar as target tugs were used for patrol missions and bombing raids against Japanese invaders over Malaya in January 1942. The RCAF purchased seven Blackburn Shark II (760 hp/570 kW Tiger VI) in 1936 for service with No 6 (TB) Squadron, later operating as No 6 (BR) Sqn on shipping patrols off the Canadian west coast. Two Blackburn Shark IIIs (800 hp/600 kW Pegasus III) were supplied to RCAF by Blackburn in 1939 as forerunners of 17 similar aircraft built by Boeing Aircraft of Canada at Vancouver, with 840 hp (630 kW) Pegasus IX and used by Nos 6 and 4 (BR) Squadrons. RCAF Blackburn Sharks, some of which operated as floatplanes, were withdrawn from service in August 1944 and five were then transferred to the RN Air Observers' School in Trinidad. Shark Mk I : Two or three-seat torpedo bomber, reconnaissance aircraft for the Royal Navy. Powered by a 700 hp (500 kW) Armstrong-Siddeley Tiger IV radial piston engine. Shark Mk II : Two or three-seat torpedo bomber, reconnaissance aircraft for the Royal Navy and RCAF. Powered by a 760 hp (570 kW) Armstrong-Siddeley Tiger VI radial piston engine. Shark Mk IIA : Two or three-seat torpedo bomber, reconnaissance floatplanes for the Portuguese Navy. Powered by a 760 hp (570 kW) Armstrong-Siddeley Tiger VIC radial piston engine. Six built. Shark Mk III : Two or three-seat torpedo bomber, reconnaissance aircraft for the Royal Navy. Fitted with a glazed canopy. Powered by a 800 hp (600 kW) Bristol Pegasus III radial piston engine. Guns: 1 x� fixed forward firing .303 in (7.7 mm) Vickers machine gun and one flexible 0.303 in (7.7 mm) Vickers K machine gun or Lewis gun. Bombs: 1 x� 1,800 lb (820 kg) 18-inch (460 mm) torpedo or 1,600 lb (730 kg) bombs. Shores, Christopher, Brian Cull and Yasuho Izawa. Bloody Shambles:Volume One:The Drift to War to the Fall of Singapore. London:Grub Street, 1992. ISBN 0 948817 50 X.
Taylor, John W.R. "Blackburn Shark." Combat Aircraft of the World from 1909 to the present. New York: G.P. Putnam's Sons, 1969. ISBN 0-425-03633-2. Thetford, Owen. British Naval Aircraft Since 1912, . London: Putnam, Fourth Edition, 1978. ISBN 0-370-30021-1. Vincent, Carl. The Blackburn Shark (Canada's Wings Vol. 1). Stittsville, Ontario: Canada's Wings, 1974. Blackburn Shark Pictures and Blackburn Shark for Sale.